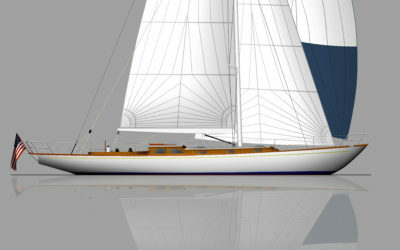 Brooklin Boat Yard is pleased to introduce the BBY 108’ flush deck sloop, currently in design development. One of the design office’s favorites from the archives, this 62’ sloop was designed in 1994 by Joel White, never made it to production. 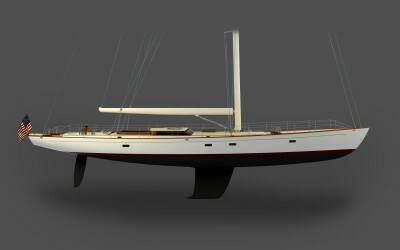 Design #50, she is based on a balance of simplicity and performance, resulting in a slender hull, with striking lines. A wolf in sheep’s clothing, the Eggemoggin 47 combines the classic elegance of yachting’s past with the performance of today’s hot racing classes. 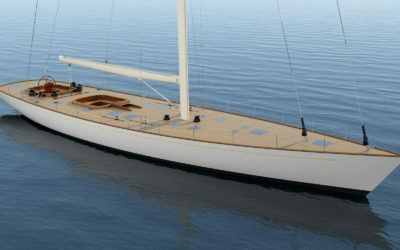 The extremely lightweight and incredibly strong hull is strip-planked cedar sandwiched between inner and outer carbon skins. 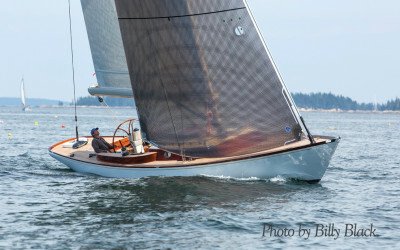 The idea behind GRACE, the first boat of Joel White’s “Center Harbor” series, was to update L. Francis Herreshoff’s QUIET TUNE to improve her performance and make use of Brooklin Boat Yard’s skill at cold-molded construction. 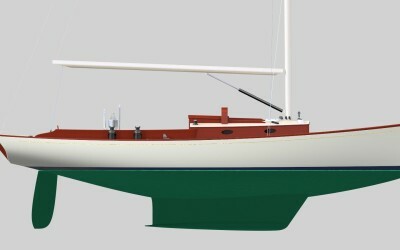 She’d have the same short-ended hull with low freeboard and low trunk cabin, but a fin keel and spade rudder would give her modern performance and handling. Brooklin Boat Yard is pleased to introduce an 82’ cruising sloop with classic lines that respects the design aesthetic of Joel White, the yard’s late founder and prominent designer. “The importance of design was engrained in me early on” says Steve White, son of Joel White and company president.